Virtually everyone wants more muscle, and for good reason – it’s the key to a great physique. Whether you’re trying to tone down, tighten up, get shredded, or bulk, getting enough protein is essential for any serious athlete. With 30g of premium whey protein and only 150-160 calories, 1g of sugar, and 1.5g of fat in every scoop, WHEY30 is maximally lean. With no fillers and no unnecessary additives, WHEY30 offers your body the raw nutrition it craves after a grueling workout. 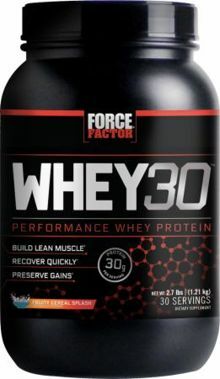 WHEY30 was formulated to provide your body exactly what it needs to optimize post-workout recovery, without unnecessary fillers and without compromise. Too many other proteins are sold by weight only, disregarding the most important element: the total amount of protein in each scoop. In some cases, protein isn’t even the majority of the powder you’re buying. WHEY30 contains 22.6% MORE protein per scoop than the leading competitor. With 30g of protein per scoop and 30 servings per tub, you get a whopping 900g of protein in each container.